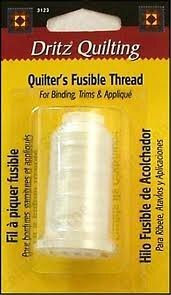 Fusible Thread is perfect for applique, or securing stitches. Your fusible thread will look like dental floss. Wind this thread onto your bobbin (no special directions, wind your bobbin as you would). Your top thread should be a fine thread, polyester, monofil (we recommend YLI Smoke) or bottom line. Shorten your stitch length, use a top stitch needle. You may need to loosen your upper tension until the stitch is even (remember you are using a fine thread with a dental floss weight - test before hopping onto your project). Cut out your applique as close to your stitch line as you possibly can. To fuse, use the hottest iron temperature setting, apply iron for 10 seconds, cool, pull off your top thread. If your top thread does not pull off easy, just heat momentarily with your iron to reheat the glue and release the top thread.